This one-act play by playwright and director Kathleen K. Johnson explores the ways in which relationships cement themselves in physical space. Hotel rooms seem out of touch with reality; unhitched from the particularities of home and insulated from the rest of the world, they occupy some other plane of existence. It is a space onto which we can project whatever we so choose, and within we might become someone greater than who we already are. “Fiercely Independent,” currently making its debut in a five-week limited engagement at SoHo Playhouse until April 7, works with the implications of this illusion that foreign spaces might prompt the sudden emergence of newer, bolder, more lucid versions of ourselves. Robert is frustrated with Julie’s idealistic notions and embarrassed by her silly voices and bits; she feels unseen, unloved and afraid that her husband is turning into someone who wants to convince her that life is not as wonderful as she believes it to be. Designed and lit by William E. Cotton, the modest set looks exactly like your run-of-the-mill, Courtyard Marriott-esque hotel room, from the unadorned plum linens, to the kitschy nature paintings on the wall, to a couple of characterless lamps placed on the desk and nightstand. A bouquet of yellow roses, which Robert ordered for Julie, stands out amidst this bleakness — a golden symbol of renewal and of the tenderness that indeed exists between the couple. Within the first five minutes of the show, a man in the audience whispered not-so-quietly to his companion, “I hate them both!” Indeed, both Julie and Robert are, at least at the play’s onset, decidedly unlikeable. The prospect of listening to the pair spar over who is the greater sufferer of their particular brand of white, middle-class ennui for 70 intermissionless minutes is, indeed, a rather punishing one. And yet “Fiercely Independent” does the impressive work of evading this insipidness, instead tangling us into its emotional web. Gallogly and Smith are both remarkable performers, painting their respective characters in shades of grey rather than black and white, allowing us to see their flaws without being forced to condemn them as individuals. It is easy, at times, to get ahead of the story. The story largely follows a predictable trajectory as we follow the highs and lows of the relationship all the way to the bittersweet — but mostly bitter — break-up. The patterns of their arguments become easily traceable and — rather dull — the dialogue is nevertheless smart, naturalistic and occasionally hilarious. 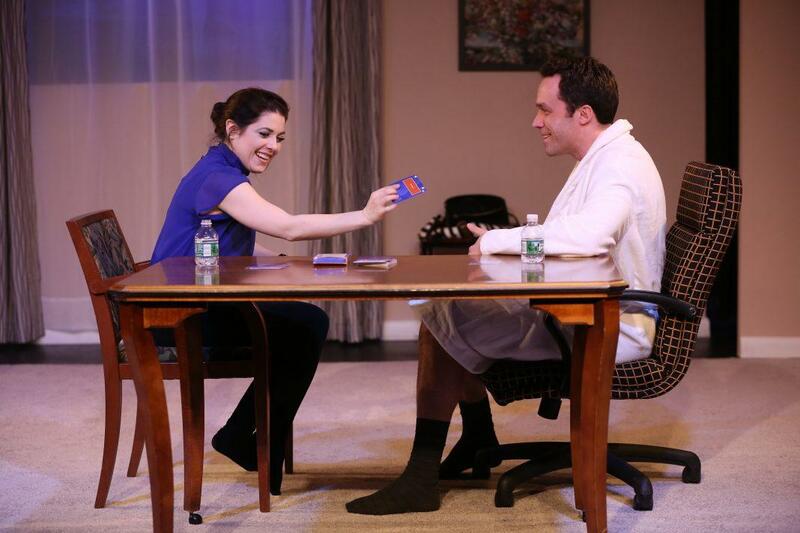 The most delightful scene in the play is one in which Julie and Robert play a card game in which one reads a line from a movie and the other must guess the film it came from. As they move through quotes from movies such as “Casablanca,” “Animal House” and “Ferris Bueller’s Day Off,” they both become animated and suddenly endearing. In these moments, the pair communicates like any other intimate couple — through hand gestures, coy teasing, unabashed interruptions and knowing smiles, speaking to years of shared experiences and inside jokes. Punctuated by interruptions from the bellhop (Jordan Sobel) and a number of blackouts used to signify the passage of time, we are taken through this heart-rending journey along with Julie and Robert, feeling the suffocating effect of their confinement within the hotel room. In many ways, the hotel room becomes a metaphor for their marriage, a space in which they are trapped as they struggle to find fulfillment while their instincts tell them to get out. Ultimately, “Fiercely Independent” is concerned with what it means to stay and fight for resolution, and what it means to walk out of the hotel room — or out of the marriage — and into the wilderness of the real world. “Fiercely Independent” is running at SoHo Playhouse, 15 Vandam St., through April 7.